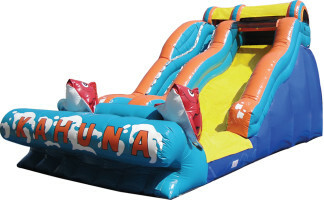 Ride the waves with your favorite aquatic creatures with our Kahuna inflatable water slide. You don't have to go all the way to California or Hawai'i to catch the best surf. Just inflate and feel the rush of adrenaline as you speed down into the cool wading pool waiting for you at the bottom.